It was really fun to see what people wanted to know more about, so thanks very much if you were one of those who sent in a question. I’m going to do this more often, so if you’d like to be part of it please do sign up if you haven’t already! You can do it here. Tracey had some questions about how we use interfacing to stabilise fabrics. We also had some questions about how Patchwork Castle got started (you can read the answers to those in this post). Do you use iron on interfacing to stabilise the baby clothes, and if so what weight? Yes! We use medium weight vilene interfacing to stabilise any stretchy or otherwise tricky fabrics. 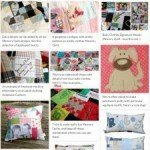 I find it’s absolutely essential if you are using different types of fabric in the patchwork. I find if I don’t stabilise the fabrics then it makes it very difficult to cut out the patches accurately, sew seams without stretching and it can make quilting more difficult too. We also sometimes use stabiliser to help balance out the weight of different fabrics in a quilt. For example, if there are cotton shirts in with t-shirts then we’d add interfacing to everything, even if the individual fabric would normally be ok without. There’s lots more information about how we work with stretchy fabrics in this in this post (it’s the most popular post on our blog!). Do you iron it (interfacing) on, then cut out or vice versa? The short answer is: we iron it on, and then cut out the patches. Part of the reason we use interfacing is that it stabilises a stretchy item so that you can cut accurately without the fabric stretching and moving. Accurately cut patchwork blocks are crucial to getting a good result in a quilt, so I’d always advise this approach. I also find it easier to do it that way around than have to worry about matching cut patches of clothing to cut patches of interfacing. If you add the interfacing after you’ve cut the patch you can end up with glue on your iron and/or ironing board. This chat is everything I love about the Facebook group. Someone has what seems a really awful problem, and straight away lovely members check in with all sorts of advice and reassurance. It’s made me think about trying out stabilising after cutting again too – the last commenter is absolutely right, much more economical! 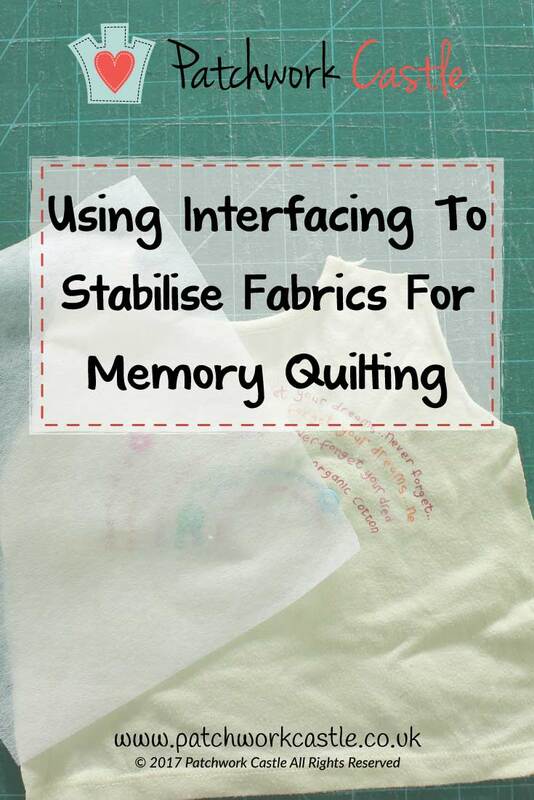 If you are looking for comprehensive advice on how to stabilise clothing for use in a memory quilt you can find step by step guidance with lots of pictures in our Baby Clothes Memory Quilt Tutorial. I’ll be working this up into a version for working with adult clothing too – keep informed about this here if that’s something you might be interested in. What a coincidence! I love this idea for a blog post and love learning how others do things. I’ve got to admit that one of the main reasons that I cut and then stabalise is to save on interfacing! I’ve just invested in the Aquaquilt 12″ block cutting dies to save a little time. I can’t wait to use them! Thank you for the blog post Chris.